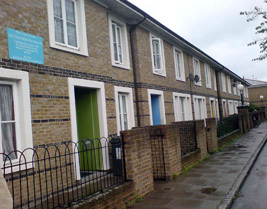 William Martin helped Spitalfields Housing Association to manage their ‘Decent Homes’ programme. Part of this commission involved undertaking a Stock Condition survey, to survey a representative sample of the Association’s housing stock. This was then be used to help programme the works needed to ensure that all the Association’s stock met the Decent Homes standard. We then tendered Contract to refurbish non compliant properties, including new kitchens and bathrooms, re-wiring and other repairs to bring these properties up to the standard. Work was completed in two phases. Spitalfields Housing Association was keen to ensure that opportunities were exploited through this contract to provide training and employment for local residents. William Martin and the Constructor Mulalley & Co worked with the Association and ‘Skillsmatch’ to recruit and employ a local Resident Liaison Office.